Mediflex offers a versatile retraction system to accommodate all surgical requirements. The DynaTrac Retractor permits use of Surgical Stays for superficial retraction as well as surgical blade attachment for deep retraction. 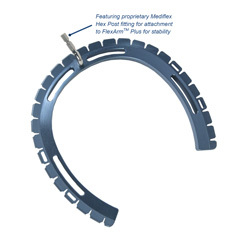 FlexArm Plus can be incorporated for off-patient positioning and maximum retractor stability.